Moldova (formerly Moldavian Soviet Socialist Republic), was on the extreme southwest edge of the Soviet Union. It was one of the smallest of the former Soviet republics with an area of only about 13,000 sq. mi. (33,600 sq. km. ), about the size of Taiwan. Its population of more than 4 million people (in 1987), 4.46 million people (estimated in 2005) nevertheless made it one of the most heavily populated regions of the USSR. 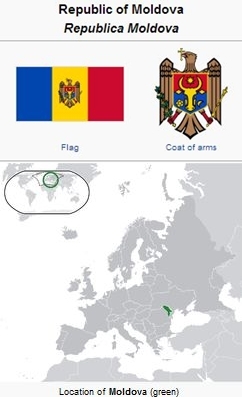 Most of what is Moldova in the 1980s, was once known as Bessarabia, and the rest, incorporated into the Soviet Union during World War II, belonged formerly to Romania. Chisinau is the capital city of this region. Moldova became indepedent of the Soviet Union in 1991, though Russian troops have remained in some parts of the country. Baptist congregations in Moldavia came to join the All-Union Council of Evangelical Christians—Baptists after World War II. Germans in the area had been evacuated eastward during the war. Moldavia became an area of interest to Mennonites in Central Asia when for a time it seemed easier to emigrate to West Germany from this republic, as had been true of the Baltic republics for some years. A number of families came to Moldavia from the Estonian and Latvian republics when the authorities there sought to stop the German influx by refusing to offer residence permits. In Moldavia it was difficult to obtain housing so the German families often settled as isolated families in local villages. For a time a cluster developed around the city of Tiraspol where a certain Pauls served as minister in a Baptist congregation. One Gennadi Dyck led a Mennonite Brethren church for a while in Grigoropol, where some Mennonites sought registration under Baptist sponsorship. These groups remained relatively insignificant, and, in time, most immigrated to other areas, or abroad. The story of Mennonites in Moldova was, therefore, as brief as it had been in the Baltic region. Those Mennonites who stayed either found their way into other churches or remained in scattered isolation. There has been no recent move to Moldova although church life in other groups continues in many places. Klippenstein, Lawrence. "Moldova." Global Anabaptist Mennonite Encyclopedia Online. 1990. Web. 23 Apr 2019. http://gameo.org/index.php?title=Moldova&oldid=141222. Klippenstein, Lawrence. (1990). Moldova. Global Anabaptist Mennonite Encyclopedia Online. Retrieved 23 April 2019, from http://gameo.org/index.php?title=Moldova&oldid=141222. Adapted by permission of Herald Press, Harrisonburg, Virginia, from Mennonite Encyclopedia, Vol. 5, p. 601. All rights reserved.